Image by thisisbossi licensed under Creative Commons. A Request for Qualifications (RFQ) released by Metro earlier in March says that seven Metrorail stations will need to be shut down for platform rehabilitation, many (if not all) of which would be shut down for weeks on end to allow work to occur. All stations from National Airport and points south in Virginia are affected. We previously wrote after Metro published an initial Request for Information (RFI) that some stations might need to be shut down for up to 90 days to fully replace their platforms. The RFQ recently published confirms that the stations in question are National Airport, Braddock Road, King Street, Eisenhower, Huntington, Van Dorn, and Franconia-Springfield. Metro has not announced the timing of this work, but it is likely not to be announced before July 2018, after which the Fiscal Year 2019 budget recently-passed takes effect. The station platforms need rehabilitation for a number of reasons. The granite edges themselves are held up by “temporary” platform braces which not only indicate the edges’ lack of structural integrity, but also block access to the emergency refuge area designed for someone to roll out of the way of an oncoming train. In addition to the platform work, Metro is looking for contractors to provide quotes for additional work which could be done at those seven stations while they’re shut down — concrete repair, installation of new wind shelters and pylons, station signage replacement, and lighting, electrical, and communications replacement. A new request added since the initial RFI is the addition of a double crossover north of King Street station, where trains could cross from one track to the other. Currently there is no crossover between Braddock Road and Eisenhower Ave nor between Braddock Road and Alexandria Yard, although there is one just before Van Dorn Street station. The length of the contract would be approximately 18 months, according to Metro, and is expected to cost in the range of $75 to $125 million dollars. UPDATE: GGWash sources tell us that the six stations south of National Airport will all be closed at once in a single “mega-shutdown” that is currently planned to stretch for 90 days during the summer of 2019. 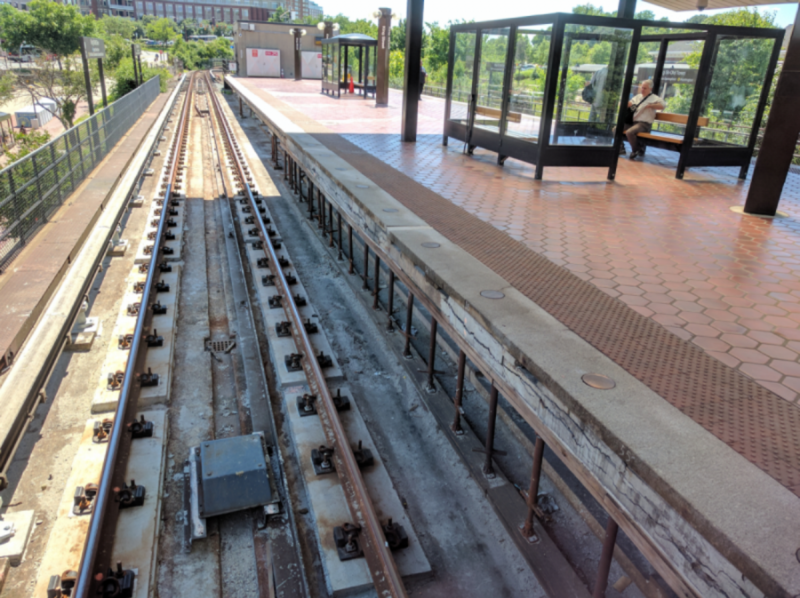 National Airport station will stay mostly open, however work will mean one of the station's three tracks will be out of service for the same platform repair work. What Metrorail station is between East Falls Church and Dunn Loring on the Orange Line? Feel free to ignore station subtitles.